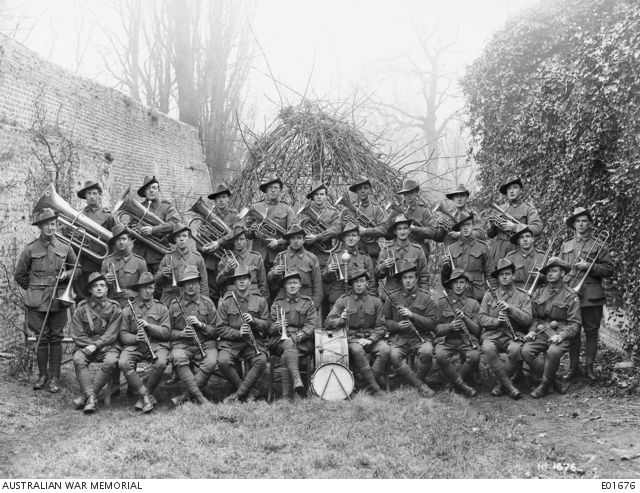 Group portrait of the band of the 1st Pioneer Battalion at Bailleul. Left to right, back row: 4187 Private (Pte) J. H. Emery; 2877 Pte W. Kirkwood; 1823 Pte H. Brown; 2567 Lance Corporal (LCpl) W. Clarke; 2816 Sergeant (Sgt) F. K. Bardsley; 3423 Pte L. B. Seymour; 4219 Pte A. Howell; 2695 Pte A. Whalley; 1846 Pte A. Fletcher. Middle row: 57 Pte A. Resuggan; 3326 Pte E. Canham; 1710 Pte H. Pittock; 2829 Pte R. W. Bryde; 1876 Pte A. Larter; 2368 Pte G. D. Horsley; 1863 Pte J. Inlah; 2428 Pte A. F. C. Woods; 2812 Pte A. Ainscough; 3916 Pte D. C. Trefoni. Front row: 2627 Pte G. Hayllar; 2684 Pte B. Stokes; 2426 Pte D. J. C. Underwood; 2813 Pte Frank Seaforth Allison (later died of disease 5 October 1918); 2724 Sgt D. Reid; 2394 Pte F. McDonald; 2859 Pte V. G. Grace; 4116 Pte A. C. Faulkiner; 4571 Pte E. Moore; 4145 Pte A. Bond.